Leaves in soups, sauces, and salads; oil for flavouring; seeds for seasoning cakes, breads, and cookies. Leaves in soups, stews, pasta sauce, poultry and meat dishes; flavours vinegar; teas. Delicious clove and aniseed flavours. Growing 30-80cm tall. Ideal pot plant, but also happy in the herb garden. Prefers full sun to partial shade. Frost and cold sensitive. Keep centres pinched to promote bushier plant and inhibit flowering. Asian dishes, salads. Spicy aniseed aroma with hints of mint. Reaching 75cm high. Frost tender. 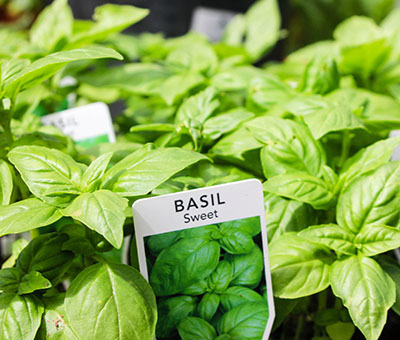 It requires the same conditions as that of Sweet Basil. 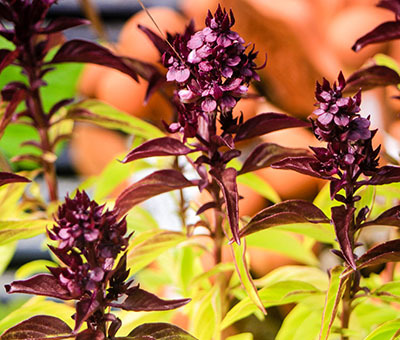 An attractive basil with purple stems and small leaves. Flower petals give colour to soups, custards, and rice; cookies; vinegars; crafts. Entire plant is edible; leaves in stews and sauces; stems flavour soups and beans; seeds in sauces and meat dishes, potpourris, and sachets. Fast-growing but short-lived annual growing to a height of 50cm. Prefers sunny position or partial shade. 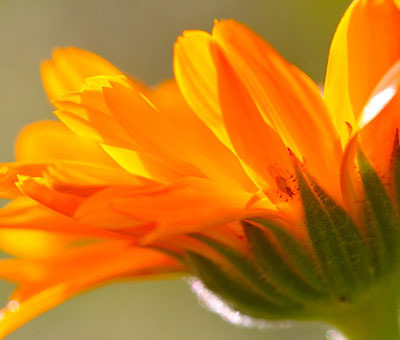 In summer plants tend to bolt to seed, but grow well throughout the rest of the year. White flowers attract beneficial insects. Frost hardy. Teas; seasoning for butter, cakes, bread, vinegars, soups, fish, pickles, salads, etc. ; flowers in crafts. Taste is not unlike parsley. A hardy, annual plant which grows to a height of 90cm. Frost hardy. 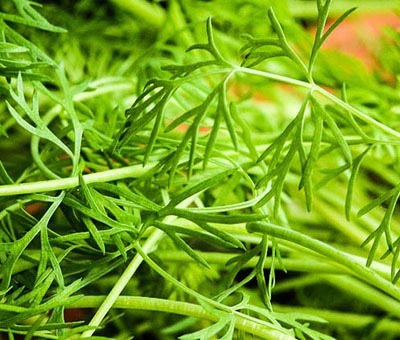 Similar in appearance to fennel. Prefers full sun or partial shade. Umbels of tiny yellow flowers produced in summer will attract beneficial predatory insects. Leaves, stems, and flowers have a peppery taste; use in salads. A self-seeding annual with a non-trailing habit growing to 35cms. 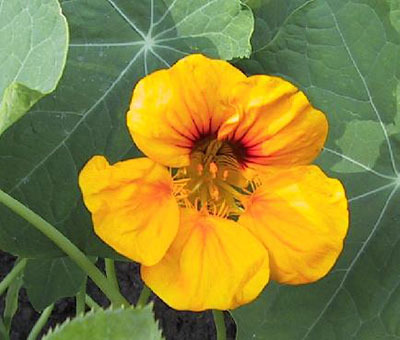 This variety has variegated leaves and a range of flower colours from yellow to red. Frost hardy. Garnish; flavouring for salads, stews, soups, sauces, and salad dressings. 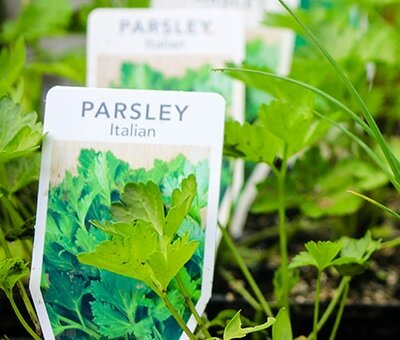 Preferred parsley due to its sweeter, stronger flavour. Grows up to 90cms, suitable for a pot or in a rich, moist position in the garden. Will tolerate a sunny to partly shaded position. Frost hardy. Mild peppery taste; used with meat, cabbage, rice, and bean dishes, stuffings, teas, butters, vinegars. 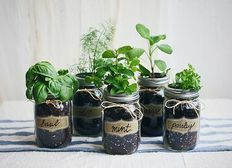 Whether you have a large backyard or just space in your kitchen, whether you have a large budget or need to do things cheaply, there are many DIY options for you to start your very own herb garden. Find some ideas here. 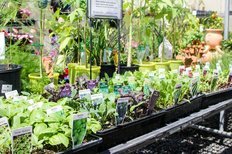 Abundance Lifestyle & Garden, can help you on your way to developing your own herb garden. 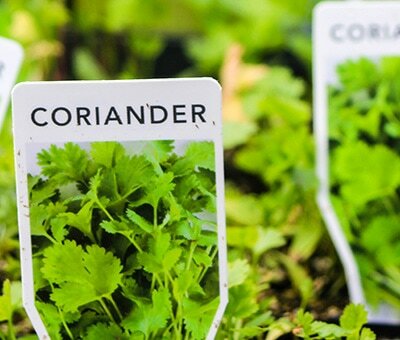 Visit us to see our range of potted herbs ready to go. View some of our range here.